Inside: We can have confidence in faith and parenting. God is in charge. We can’t live with the fear our kids will be messed up because of us. The stove had multiple kettles filled with the contents of supper. The smell of pot roast was wafting through the air, testifying it was nearly time to eat. I was trying to coordinate all the dishes being done in time amidst five voices creating an ear-deafening sound. My body was weary from the day, and the thought of the kids shoveling food quickly in their mouths, and then leaving the mess behind, had me feeling more tired. Three of the boys were cackling “mom”, the toddler was dumping dried beans on the floor under my feet and my daughter was prodding me about something. As I bee-lined to the stove, I stubbed my toe on the bar stool sitting in the middle of the floor where it had been obviously moved. My face started to flush and I could feel frustration welling up inside me. Just like the kettles boiling on the stove, I was ready to release my anger. After I got all my words out, I felt better, but from the look of the kids’ quarter-sized eyes, I realized I messed up. Mommy fails. Again. Wow, God must be really glad He sent me these 5 kids. Honestly, I don’t do well in stressful situations and my anger can come out like the pressure valve being released on a machine. Many times, my emotions are like a bottle of soda that has been shaken, foaming out the top, and spilling my contents on everyone. Many days, I feel so broken for this job of parenting. I can’t get myself right because I’m really a big ‘ole mess. How can I be sure I don’t mess my kids up too? Check out my other post about messy parents here. Do you ever feel like other moms have this parenting gig down and they seem to enjoy it? I, on the other hand, get extremely excited when bedtime comes. Did I just admit that, promise you won’t tell my kids? A few months ago, God gave me a revelation. Those other moms are broken and messy too. (Romans 3:23, NLT). For everyone has sinned; we all fall short of God’s glorious standard. God is refining and re-making us. He has good things planned for us. Here’s the thing about those other moms, I’m not present in their houses around dinner or when their kids are flying off the handle. (How I wish I could be a mouse in their house, it would be comforting to know I’m not alone). God also showed me that I needed to give myself grace in this journey. Motherhood and faith are a lot alike. There will be moments of failing and days of growing. We approach both without seeing but believing. Faith and motherhood both need time in God’s Word in order to excel, and find wisdom for this journey. The only way I can become a great Christian mom is by being connected to God. As I grow in faith, I grow in my mothering. We can have confidence in faith and parenting when we realize God is in control of all the details, He has a plan and everything will turn out for the best. As Christian moms, we have a great resource at our disposal: God’s wisdom in the Bible. As we pray for guidance, He will lead us to parent our children in the right way. This doesn’t mean we won’t make mistakes and screw up, actually, we will, but we have the ability to pray for greater wisdom for next time. Teach them that God assures us we will struggle in life. Model to them the importance of prayer during hard circumstances. God promises to help us in our struggles. Let your kids experience unhappiness, don’t give them unreal expectations. Sometimes life stinks, you accept and await tomorrow. Don’t pressure them to be perfect. We know God is the essence of perfection. We can’t expect perfect children. Don’t rescue them. Growth happens through failing and making mistakes. Model growing faith and reliance on God. Let our children see us spending time in God’s word. When times are tough, we show them how to lean into God. So Mom out there, who is serving her children, please give yourself grace in this season. Pray for guidance, strength, and endurance. Spend time in His word for your daily refreshment. As far as my anger-releasing, I have been more intentional in stepping back and regrouping when I start to feel stressed. Exercise every day and spending time in His word makes a huge difference. Moms, you are doing a great job! Your kids will turn out exactly as God needs them to. Thank you for those sweet words. I have kids 6,5 & 2. Let’s just say I feel like everyday is messy. When I set my expectation on a perfect day my hopes are always dashed. But when God gently reminds me that it is only by seeking His face and bringing Him into this everyday life that I find strength and grace for the days. Naomi- I’m right with you friend..messy and messed up:) Yes seeking His face is the most important thing we can do as moms. Glad you stopped by! I’ve definitely had my fair share of mommy-fails too. Both my daughters are grown and married now, but I still can have those Mommy-fails even now. I’m so thankful for grace for me, and grace for them! Blessings to you, Julie. Lisa- Thank you for sharing…I never thought of failing once they leave the nest. Thanks for that perspective…it helps to remember grace, doesn’t it? Blessings to you also Lisa! Brenda- yes, parenting is hard. Each season is hard for a different reason. I appreciate your sharing and stopping! These principles are so spot-on, and I’m smiling at the title of this post, because I can remember a time when that was one of my biggest fears! Michele- Thank you for the kind words! I’m still in the trenches, and it’s a battle everyday! I’m hoping I can say the same thing some day about being past it. Hi, Julie. I think my house looks and sounds a lot like yours does! It and all of us in it are a mess . . . and that’s okay, because God specializes in cleaning up messes, right? 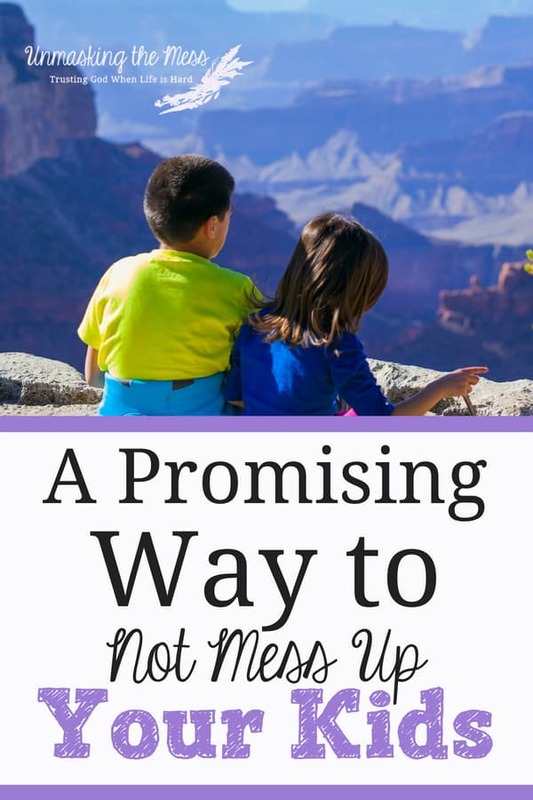 We mamas sure aren’t perfect; neither are our kids. But we get to show our kids Who to turn to in our mess. Our kids will learn how to handle their messes well when they see us model the thoughts, attitudes, actions and words that send us to Jesus. Oh my goodness, I can so relate! My favorite time of day is when the littles go down for the night. I’m a work in progress, too. Thankful for God’s grace. Thank you, friend. Oh my gosh Julie! Amen, amen, amen! I have been in those pressure valve moments all too often. I have done the exact same thing. But I learned the lessons as you described. This was so well done! I could relate to what you shared so many times. Thank you for being transparent and sharing the better goals in parents, not perfection. Thank you Gretchen, it’s so comforting to hear I’m not alone with the frustration with motherhood! God does make all the difference in our mothering and in our children’s hearts through our mistakes also. Love your heart for motherhood Julie! Thank you, Crystal! I appreciate it! I am confindant you are an AMAZING mom! Thanks for sharing this at the #GraceMoments Link Up! Aww Dawn, you’re so sweet! Thank you for the encouragement and sharing your story a little too. I have so been there and can say with confidence that you are not alone. We all mess up. We make mistakes. Nut I adore your list of ways to ensure we don’t mess up our kids, because you’re right, it’s all about pointing them to Jesus. Those are really thought-provoking points! My husband and I don’t have kids yet, but these are wonderful words to read ahead of time and keep them ready when needed! “God also showed me that I needed to give myself grace in this journey.” I agree that none of us is perfect, and if we can give each other and ourselves grace, we will be a lot less stressed out. I try to apologize to my adult children whenever they mention something that hurt them in their childhoods. It isn’t often but I find that it helps them let go of some of the hurts I inadvertently inflicted.